What to eat in Philippines? 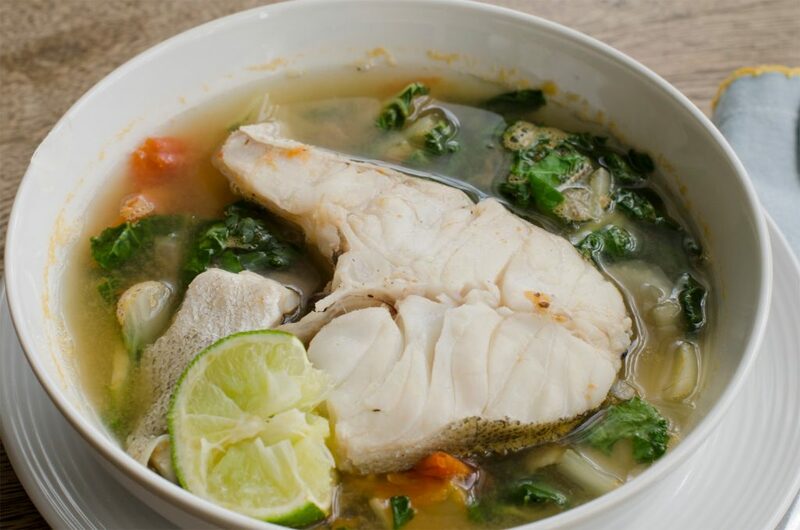 Tinola is a soup-based dish served as an appetizer or main entrée in the Philippines. Traditionally, this dish is cooked with chicken, wedges of green papaya, and leaves of the siling labuyo chili pepper in broth flavored with ginger, onions and fish sauce. A common variant substitutes fish or pork for chicken, chayote instead of papaya, or with tomatoes and moringa leaves known as marungay or malunggay or kamunggay (in Cebuano), instead of pepper leaves. Lumpia is a spring roll of Chinese origin commonly found in Indonesia cuisine and the Philippines. 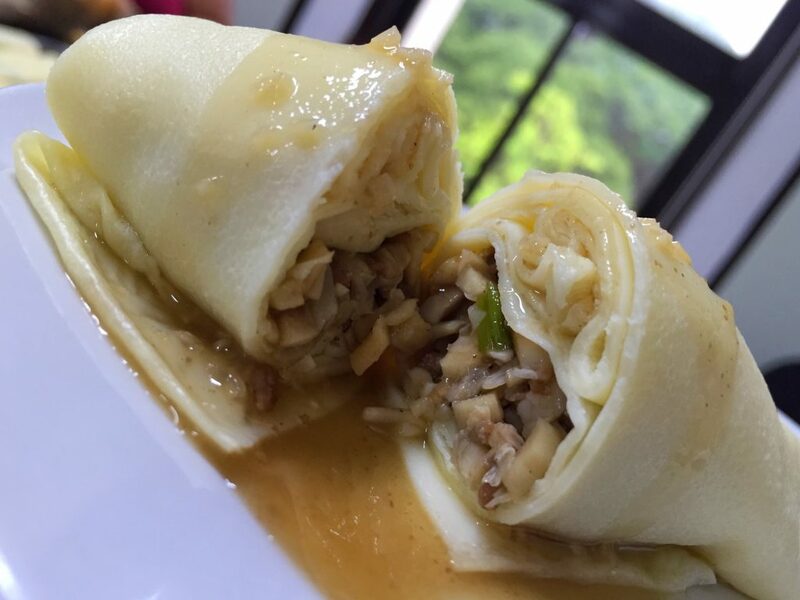 It is a savoury snack made of thin crepe pastry skin called “lumpia wrapper” enveloping a mixture of savoury fillings, consists of chopped vegetables (carrots, cabbages, green beans, bamboo shoots and leeks) or sometimes also minced meat (chicken, shrimp, pork or beef)..
Lumpiang ubod is variation which are made from julienned ubod (heart of the coconut tree). 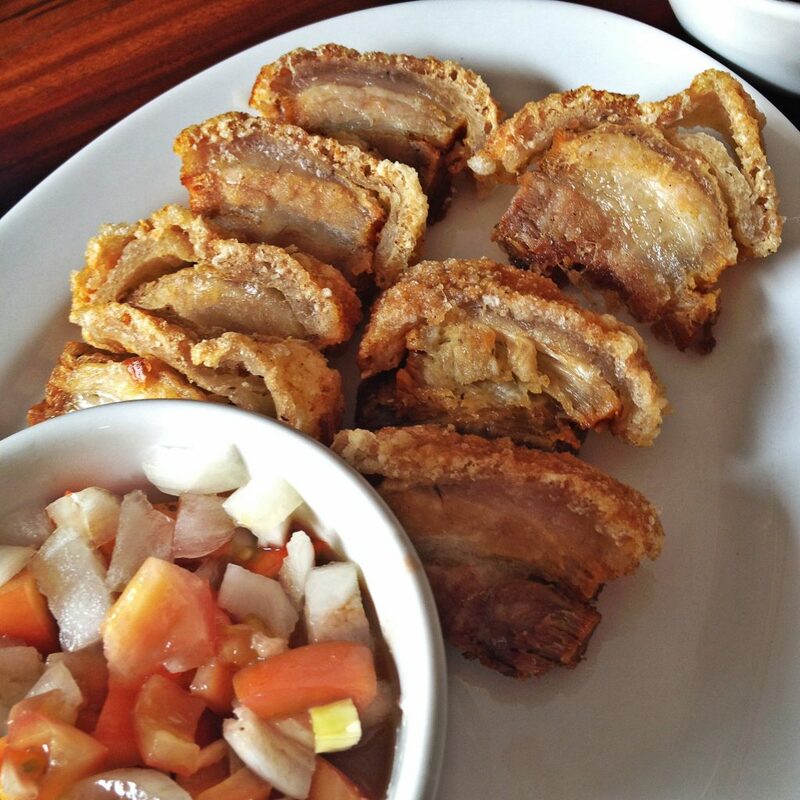 In Philippines Chicharon is ubiquitous as it is a well-loved snack, and may be bought anywhere, from large supermarket chains to sari-sari stores, and even from vendors on foot. It is popular as pulutan or finger food, to be eaten while consuming alcoholic beverages. It is also used as a topping on many native vegetable and noodle dishes. 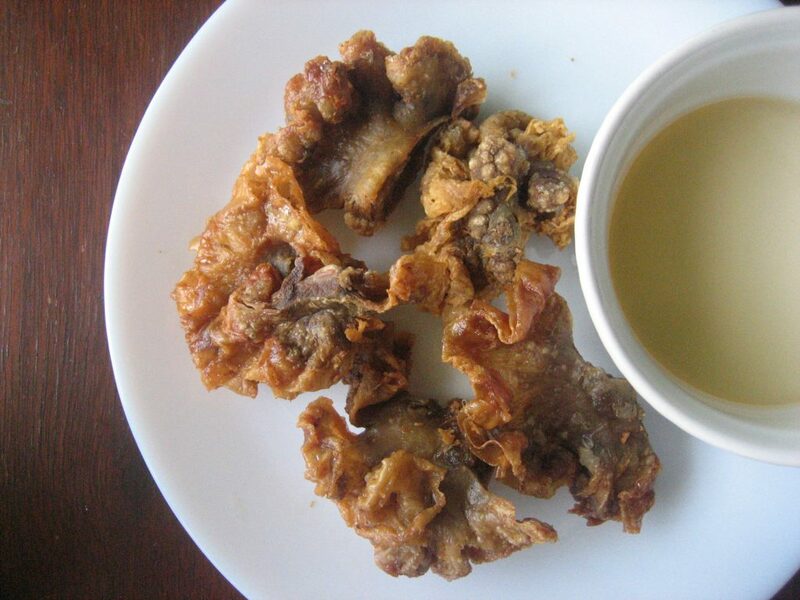 Pork chicharon is prepared by deep-frying dried pork rind with a little salt. It may be dipped in coconut vinegar spiced with soy sauce, chopped garlic and labuyo, or eaten with other condiments like bagoong, lechon liver sauce, or atchara. Aside from pork rind, chicken skin may also be made into chicharong manok, whereas chicharong bulaklak—literally ‘flower chicharrón’, named for its distinctive shape—is made from pig mesentery. Sinigang is a Filipino soup or stew characterized by its sour and savoury taste most often associated with tamarind (Filipino: sampalok). 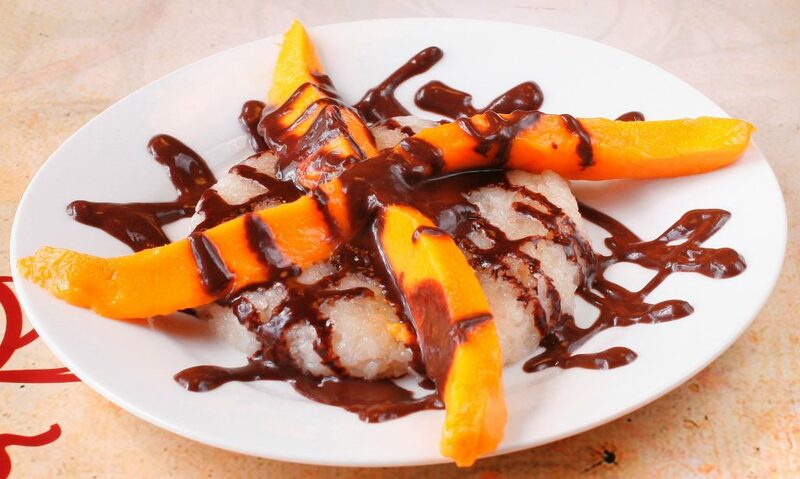 It is one of the more popular viands in Philippine cuisine, and is related to the Malaysian dish singgang. While present nationwide, sinigang is seen to be culturally Tagalog in origin, thus the versions found in the Visayas and Mindanao may differ in taste (mainly ginger is an additional ingredient). 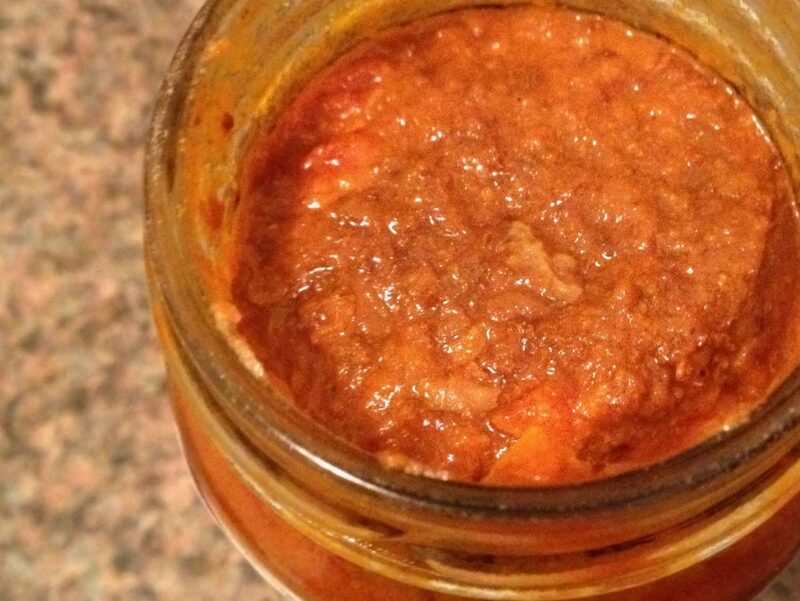 Fish sauce is a common condiment for the stew. 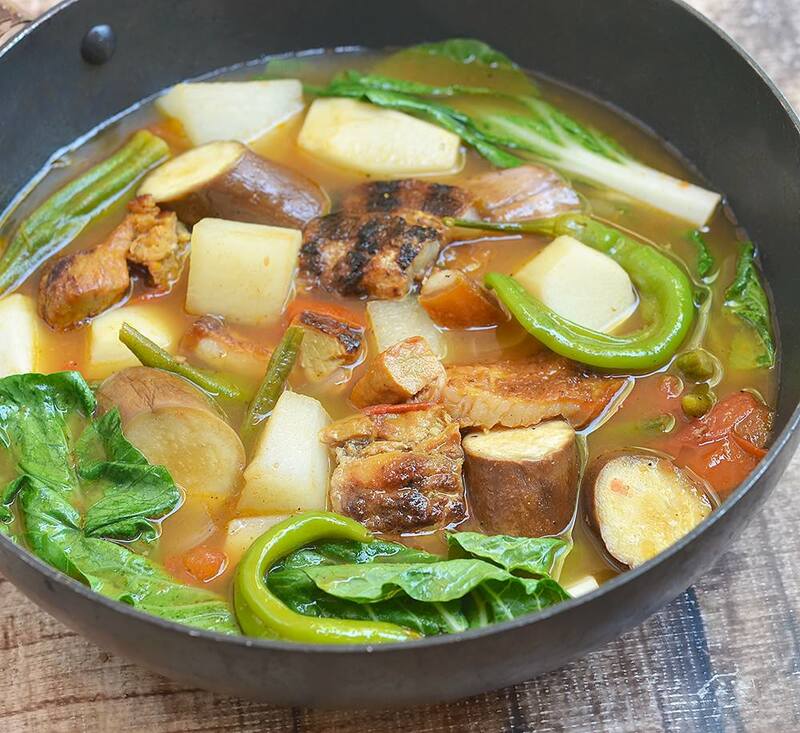 A one-pot meal like Beef Sinigang (Sinigang na Baka) with the ingredients of healthy choices – a vegetable that provides many nutrients including potassium, dietary fiber, vitamin A and C. While meat like beef supply nutrients that include protein, vitamin B and E, iron, zinc, and magnesium. Longaniza is a Spanish sausage (embutido) similar to a chorizo and also closely associated with the Portuguese linguiça. Its defining characteristics are interpreted differently from region to region. It is popular in the cuisines of several regions of Spain, Puerto Rico, Dominican Republic, El Salvador, Mexico, Chile, Argentina, Uruguay and the Philippines. Filipiono Longaniza : Longganisa refers to sausages flavoured with indigenous spices, with each region or province having its own variation. Among others, Lucban is known for its garlic-laden longanizas (derecado, “spiced”); Guagua for its salty, almost sour, variety. 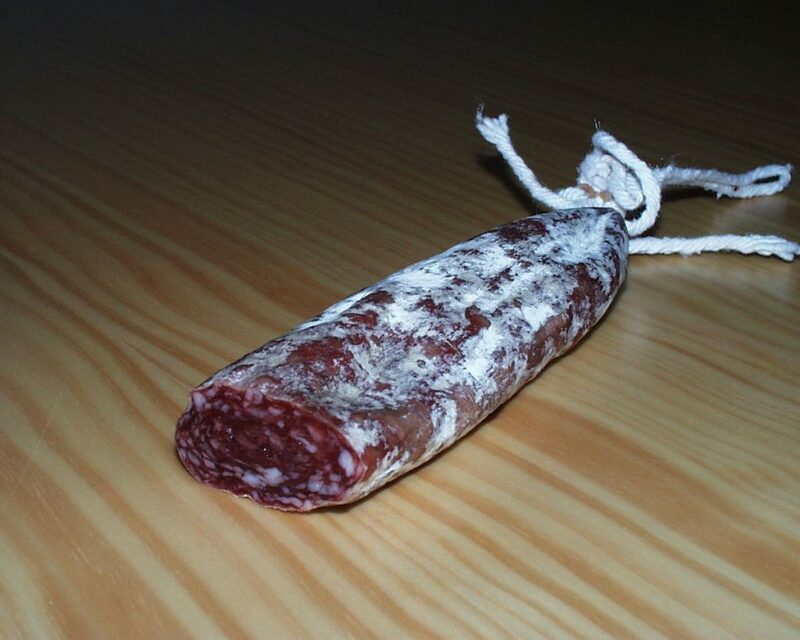 Longganisang hamonado (from the Spanish: longaniza jamonada), by contrast, is known for its distinctively sweet taste. Unlike Spanish chorizo, Filipino longganisa can also be made of chicken, beef, or even tuna. Commercial varieties are made into links, but homemade sausages may be simple patties. Taba ng Talangka literally means fat of small crabs. 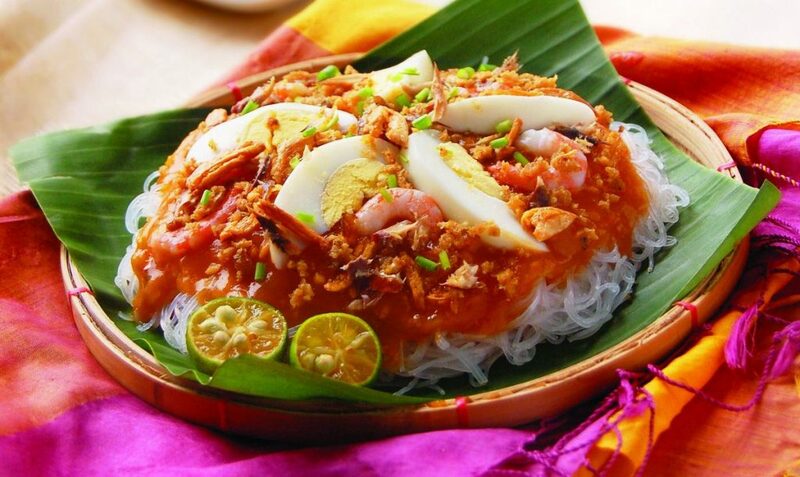 It is Filipino delicacy composed of crab roe or eggs (Filipino version of caviar). “taba ng talangka” (crab roe) is a sought after Filipino delicacy and also one of the best “pasalubong” (souvenir) to bring home from the Philippines. 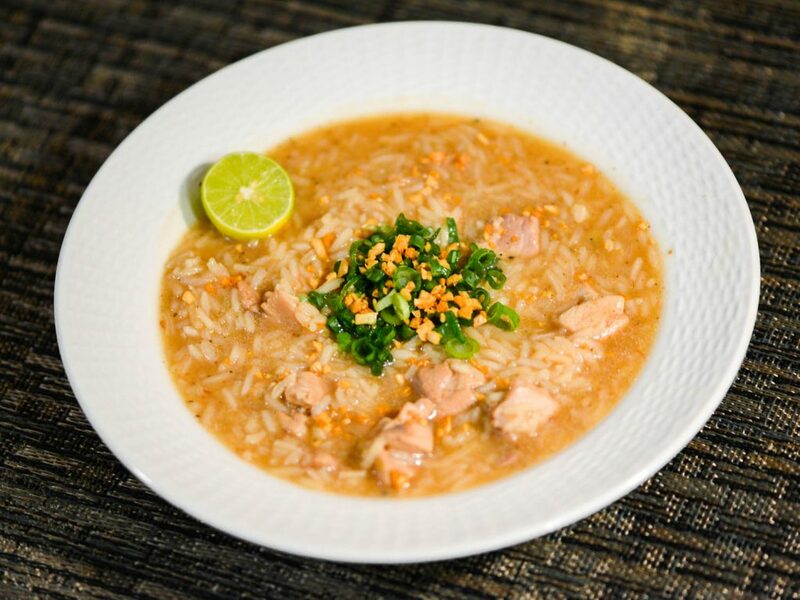 Arroz caldo is a hearty Filipino congee made with chicken and rice and seasoned with onion, garlic, ginger, and fish sauce and topped with crunchy fried garlic. 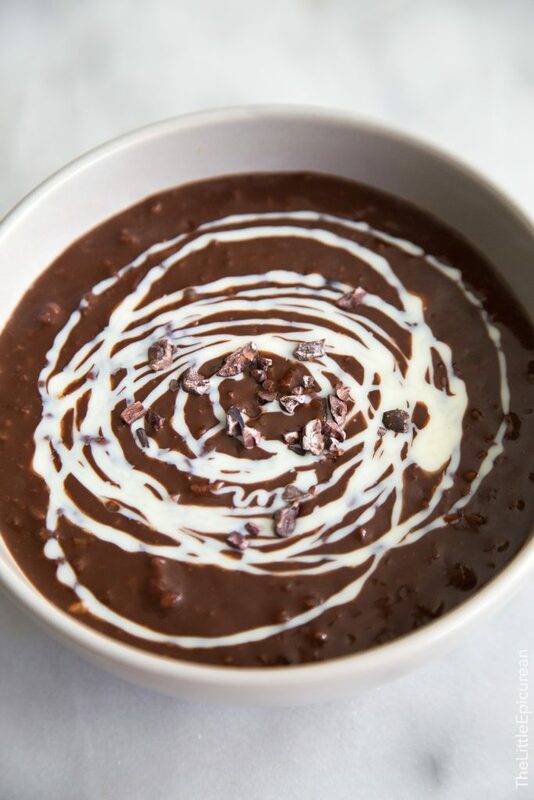 The result is a quick, comforting bowl that’s a perfect wintertime meal (and rivals chicken soup for its ability to sooth those suffering from a cold). 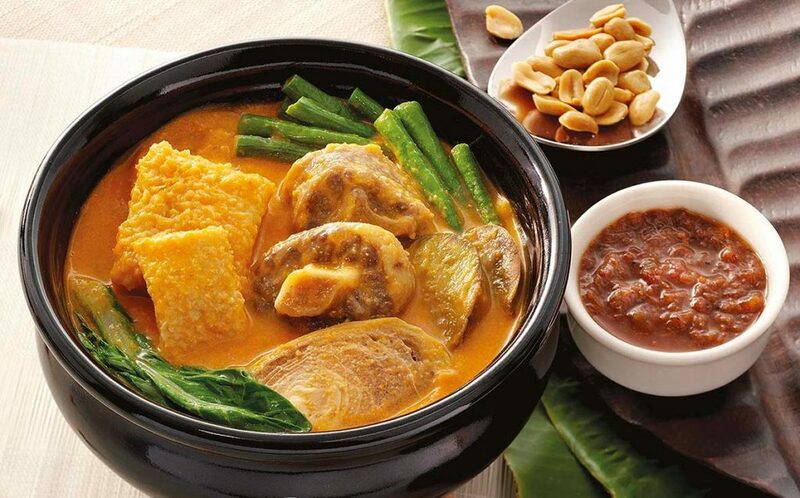 Kare-kare is a Philippine stew complimented with a thick savory peanut sauce. It is made from a base of stewed oxtail (sometimes this is the only meat used), pork hocks, calves feet, pig feet, beef stew meat, and occasionally offal or tripe. 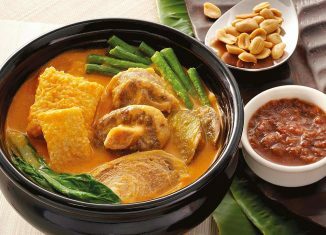 Kare Kare can also be made with seafood (prawns, squid, and mussels) or all vegetables. Vegetables, which include (but are not limited to) eggplant, Chinese cabbage, or other greens, daikon, green beans, and asparagus beans are added — usually equaling or exceeding the amount of meats. The stew is flavored with ground roasted peanuts or peanut butter, onions, and garlic. It is colored with annatto (extracted from annatto seeds in oil or water) and can be thickened with toasted or plain ground rice. 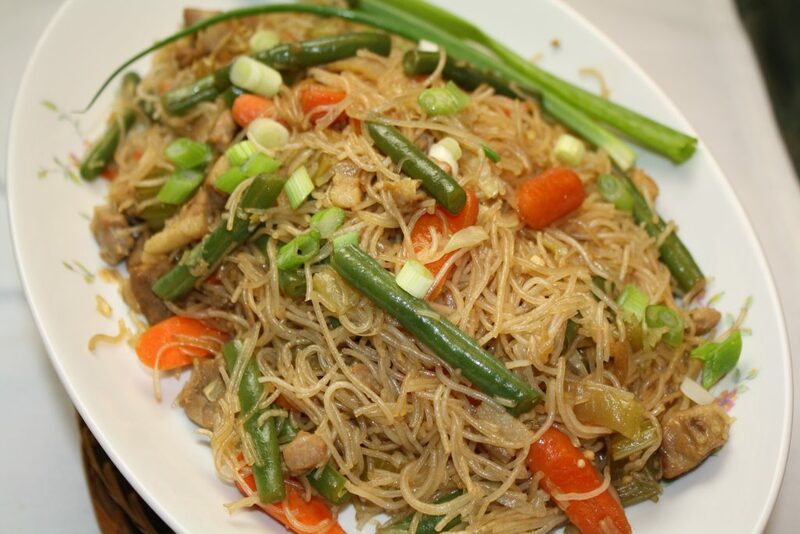 Pancit Habhab is a delicious Filipino noodle dish. This dish is eaten without using any utensils since it is traditionally served on a banana leaf. 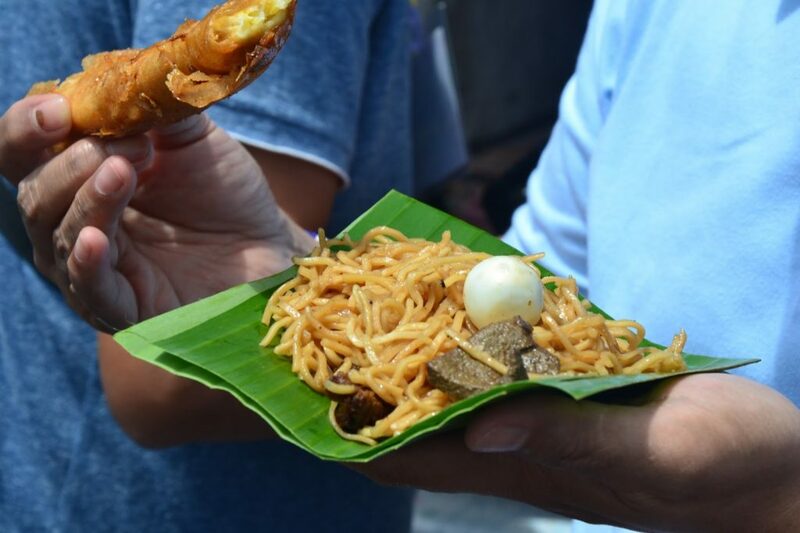 The Pancit Habhab is conveniently rolled inside banana leaf and all you have to do is push the noodles to your mouth. This is usually drizzled with vinegar before serving. Camaro (mole cricket) is a species of cricket found in rice fields. 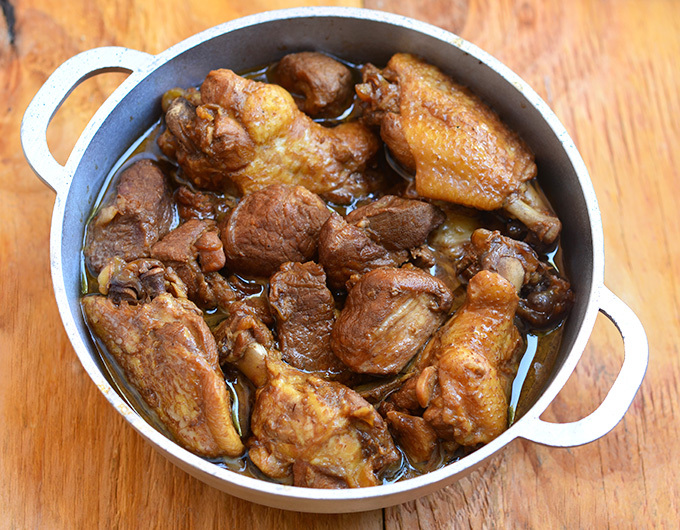 Camaro are often cooked adobo-style, flavoring it with soy sauce and vinegar. It is described as crisp as shrimp and tastes like liver. Bulalô is a beef dish from the Philippines. It is a light colored soup that is made by cooking beef shanks and marrow bones until the collagen and fat has melted into the clear broth. 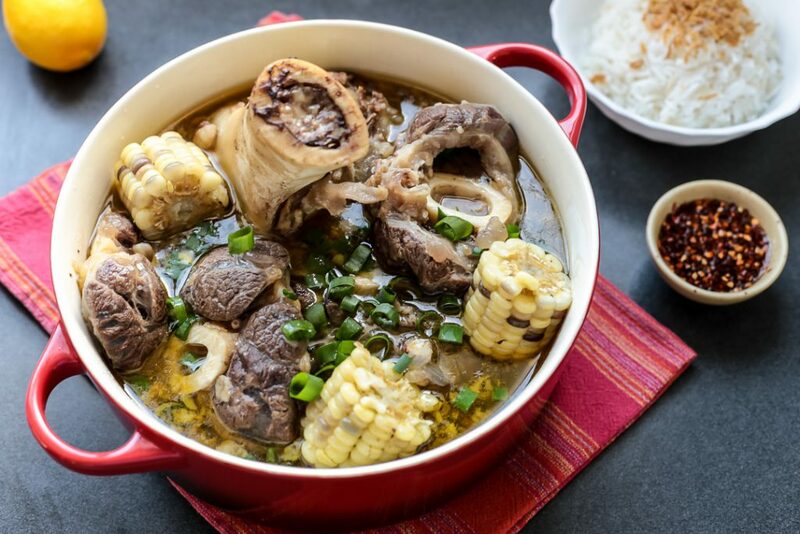 Bulalo is native to the Southern Luzon region of the Philippines. 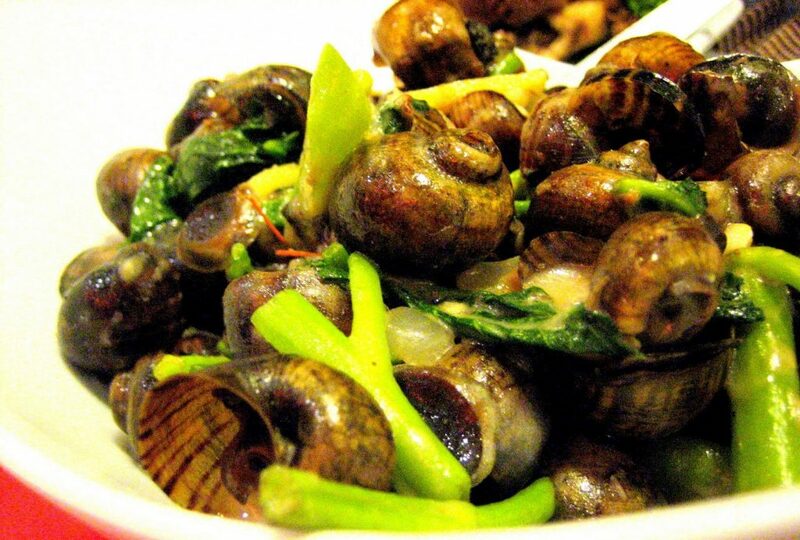 Kuhol sa Gata is a freshwater snail stewed in coconut milk. Snail is considered as an exotic food but it tastes good when cooked. Kuhol are bought live in most seafood market. They are harvested mostly in an irrigated rice field so they have to be thoroughly cleaned in and out before cooking. 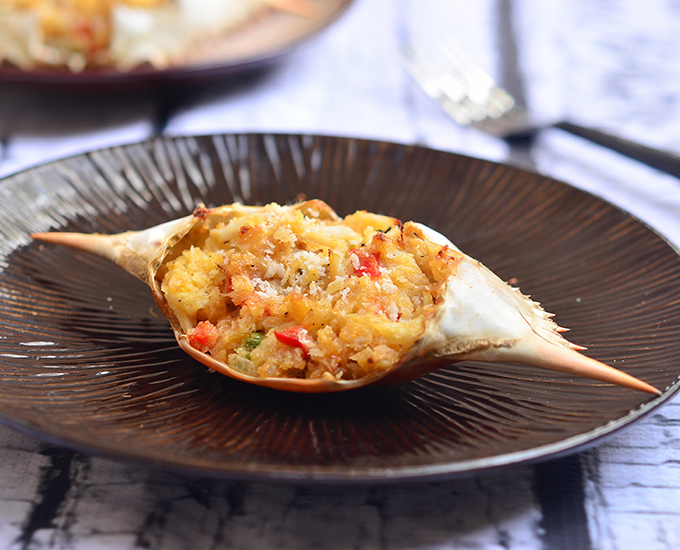 Rellenong alimango is stuffed mud crabs with crab meat, eggs, vegetables and spices. Sinugno is a healthy and flavorful Filipino fish dish. 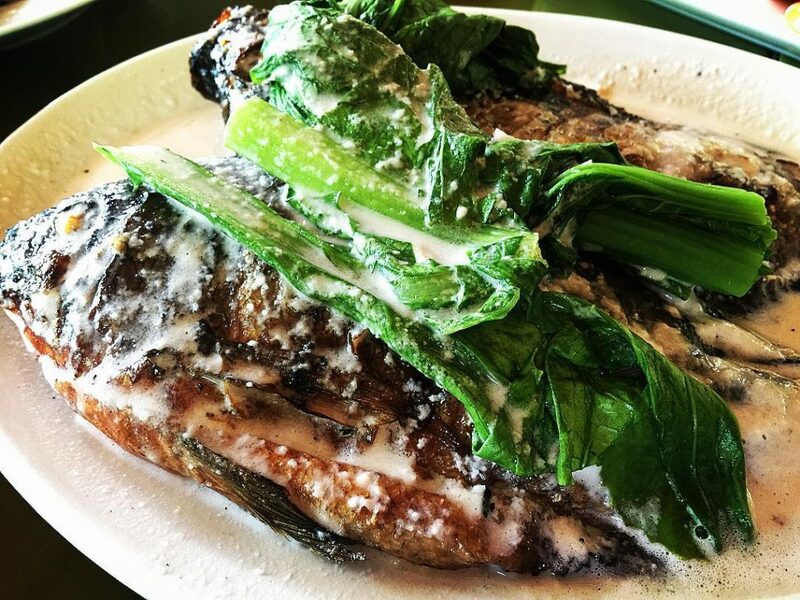 The grilled tilapia gives a smoky flavor that balances out the creaminess of the coconut milk. Inihaw na Panga ng Tuna is Grilled Tuna Jaw. 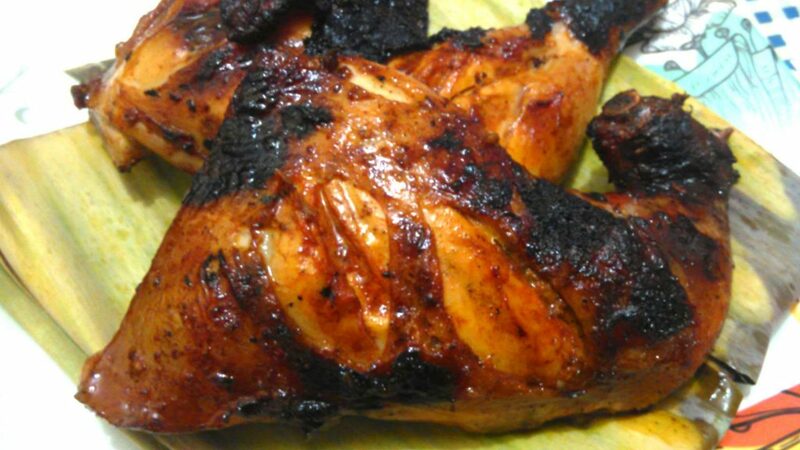 This is marinated in a sweet and spicy soy sauce and lime mixture and basted with Teriyaki sauce. 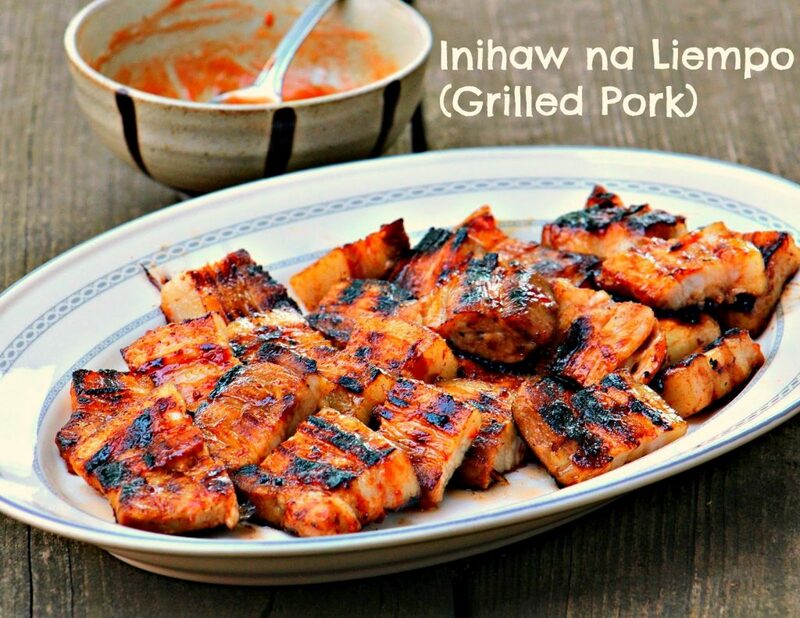 It is a perfect dish for pulutan and goes well with a cold bottle of beer. This also makes a good dish for dinner along with white rice. Pinakbet (also called pakbet or pinak bet) is an indigenous Filipino dish from the northern regions of the Philippines. Pinakbet is made from mixed vegetables steamed in fish or shrimp sauce. The word is the contracted form of the Ilokano word pinakebbet, meaning “shrunk” or “shriveled”. 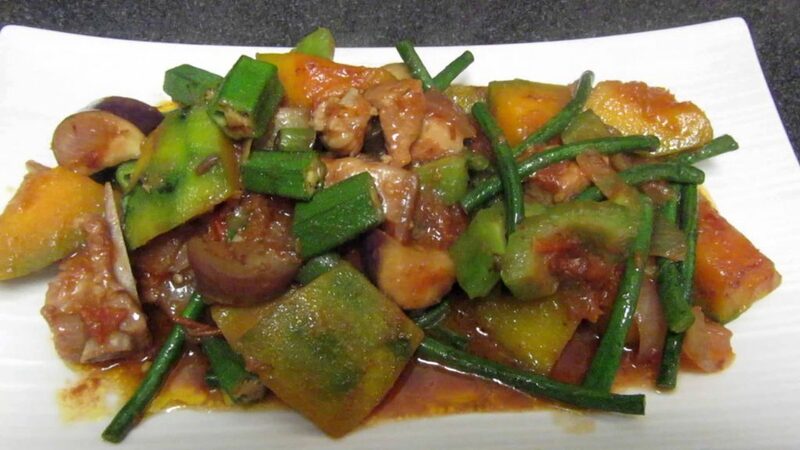 The original Ilocano pinakbet uses bagoong, of fermented monamon or other fish, for seasoning sauce, while further south, bagoong alamang is used. The dish usually includes bitter melon (ampalaya). Other vegetables used include eggplant, tomato, okra, string beans, chili peppers, parda, winged beans, and others. Root crops and some beans like camote, patani, kadios are also optionally added. The young pod of marunggay is also added. It is usually spiced with ginger, onions, or garlic. Lechón is a pork dish in several regions of the world, most specifically Spain and its former colonial possessions throughout the world. 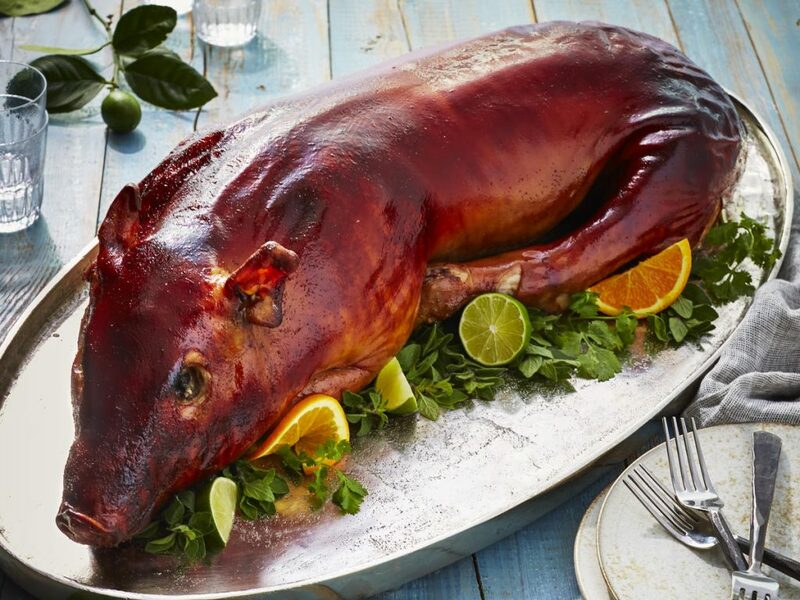 Lechón is a Spanish word referring to a roasted suckling pig. 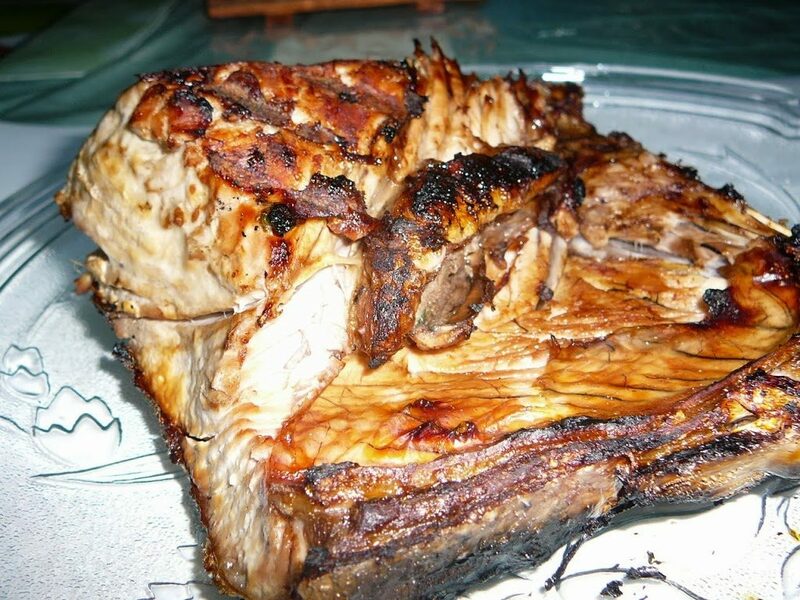 Lechón is a popular food in the Philippines, Cuba, Puerto Rico, the Dominican Republic, North Sulawesi province of Indonesia, other Spanish-speaking nations in Latin America, and Spain. The dish features a whole roasted pig cooked over charcoal. 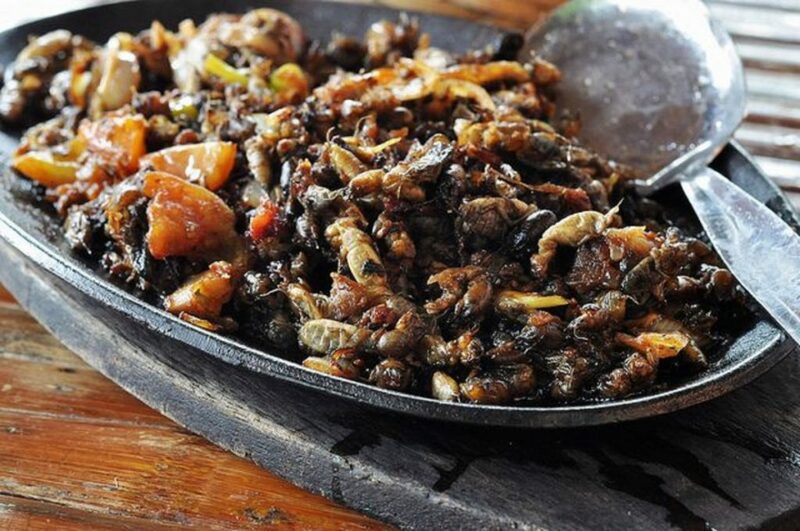 Additionally, it is a national dish of the Philippines with Cebu being acknowledged by American chef Anthony Bourdain as having the best pig, and also being the national dish of Puerto Rico. 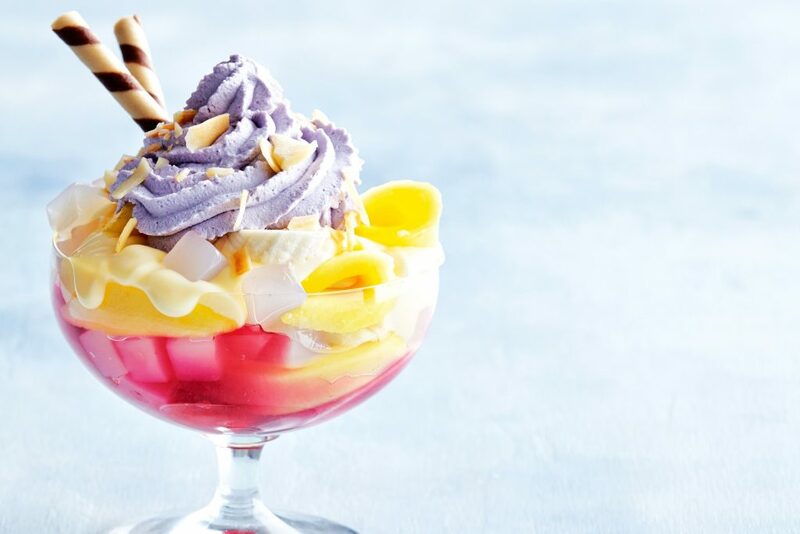 Haluhalo or Halo-halo (“mixed together”) is a popular Filipino dessert with mixtures of shaved ice and evaporated milk to which are added various ingredients, including boiled sweet beans, coconut, sago, gulaman (agar jelly), tubers and fruits. It is served in a tall glass or bowl. Tapa is dried or cured beef, mutton, venison or horse meat, although other meat or even fish may be used. 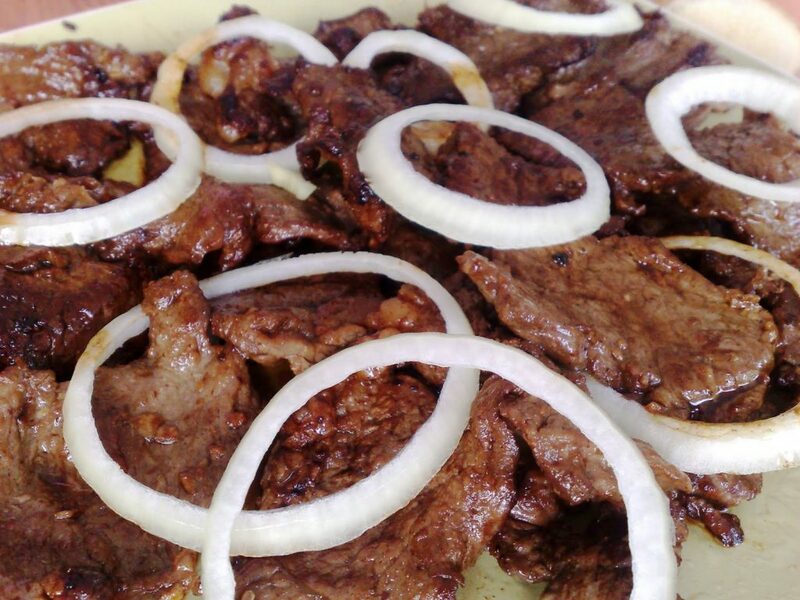 Filipinos prepare tapa by using thin slices of meat and curing these with salt and spices as a preservation method. Tapa is often cooked fried or grilled. 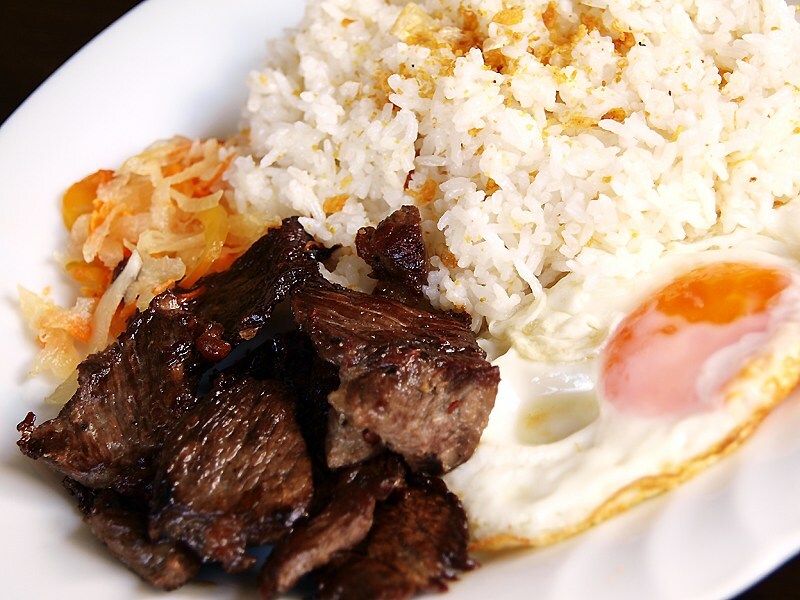 When served with fried rice and fried egg, it is known as tapsilog (a portmanteau of the Filipino words tapa, sinangag and itlog [egg]). It sometimes comes with atchara (pickled papaya strips) or sliced tomatoes as side dish. Vinegar or ketchup is usually used as a condiment. 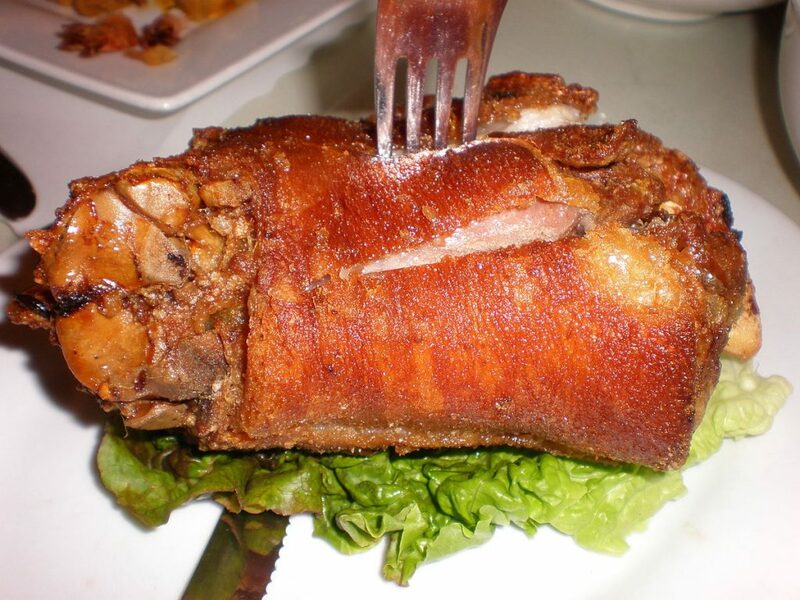 Crispy Pata made whole pork leg boiled until tender and then deep-fried until golden and crisp. 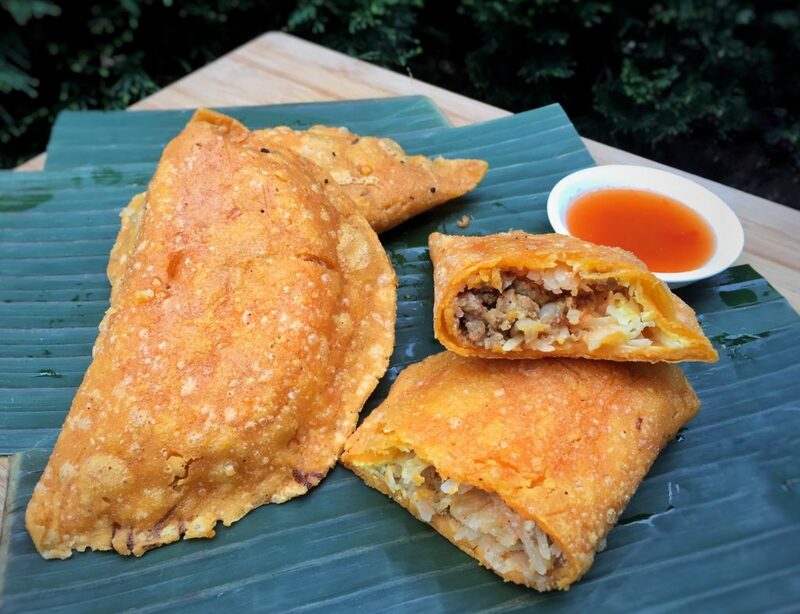 Crunchy on the outside and moist on the inside, this popular Filipino delicacy is sinfully delicious! 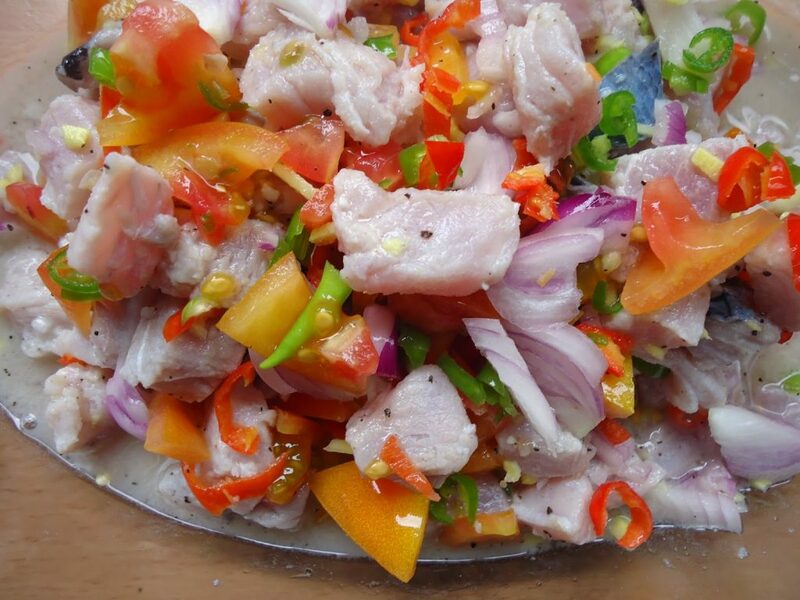 Kinilaw (literally “eaten raw”) is a raw seafood dish native to the Philippines, similar to ceviche. It is more accurately a cooking process that relies on vinegar to denature the ingredients, rather than a dish, as it can also be used to prepare meat and vegetables. The most common kinilaw dish is kinilaw na isda (“fish kinilaw”) prepared using raw cubed fish mixed with vinegar (usually coconut vinegar or cane vinegar) as the primary denaturing agent; along with a souring agent to enhance the tartness like calamansi, dayap, biasong, kamias, tamarind, green mangoes, balimbing, and green sineguelas. It is flavored with salt and spices like black pepper, ginger, onions, and chili peppers (commonly siling labuyo or bird’s eye chili). 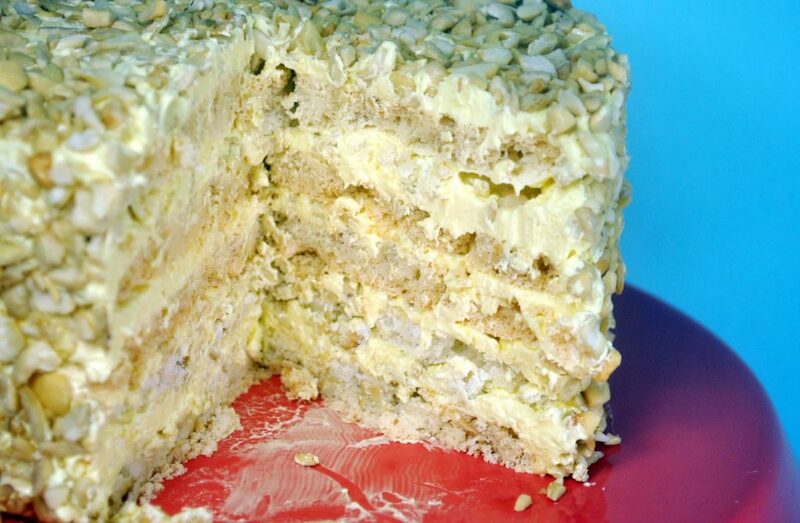 Sans rival is a Filipino dessert cake made of layers of buttercream, meringue and chopped cashews. Its name comes from the French phrase with the literal meaning without rival. The cake may be decorated, left plain or garnished with pistachios. This recipe has its roots in the dacquoise. Dinuguan is a Filipino savory stew of pork offal (typically lungs, kidneys, intestines, ears, heart and snout) and/or meat simmered in a rich, spicy dark gravy of pig blood, garlic, chili (most often siling mahaba), and vinegar. 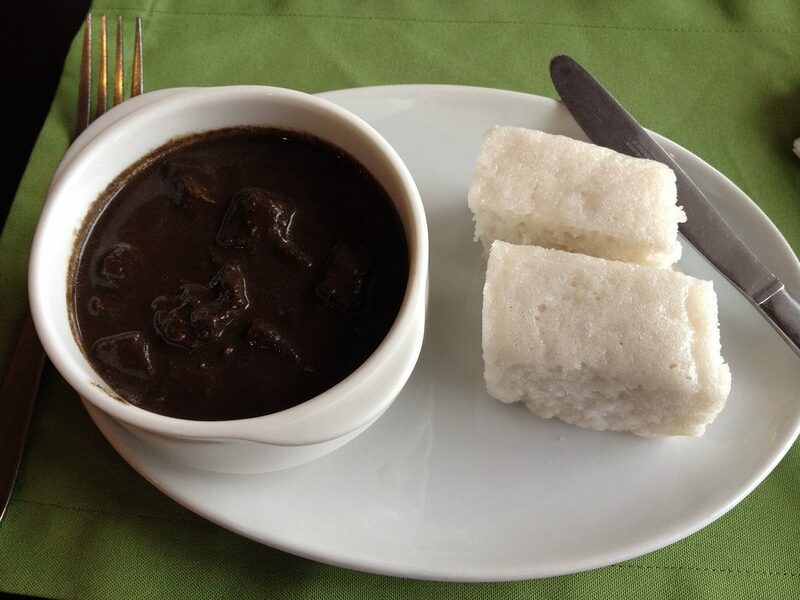 Dinuguan is usually served with white rice or a Philippine rice cake called puto. 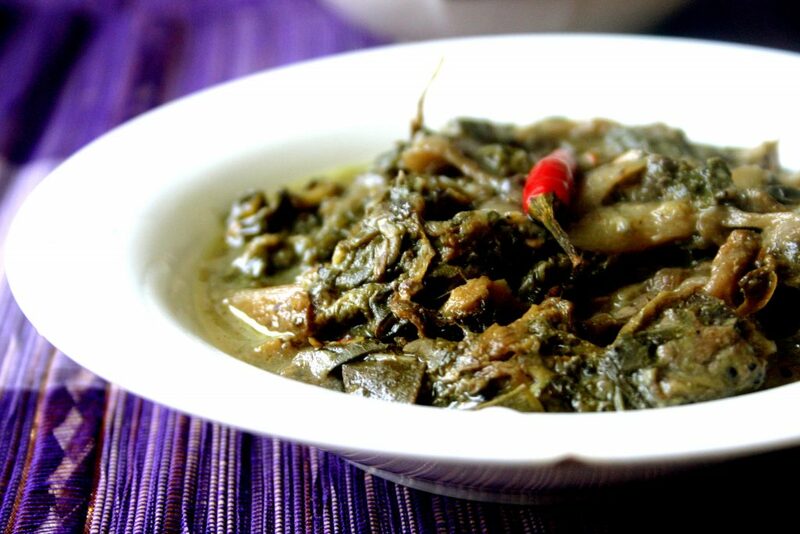 “Laing” (or Natong) is a spicy dish that is Coconut milk (or cream) based with dried taro leaves. 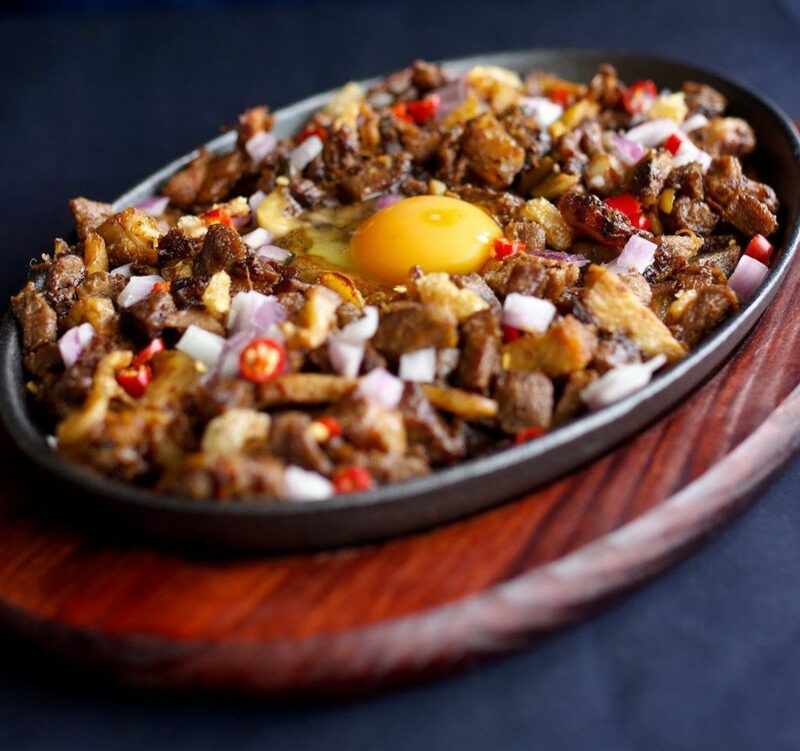 Sisig is a Filipino dish made from parts of pig’s head and liver, usually seasoned with calamansi and chili peppers. 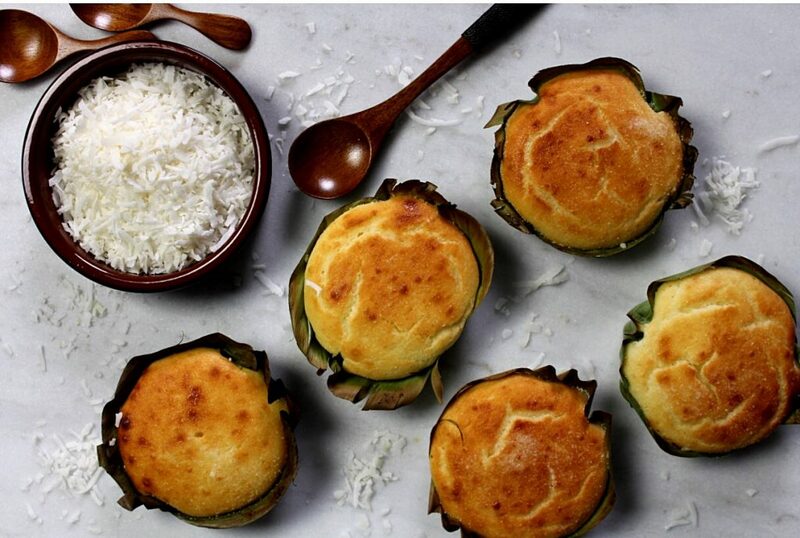 Bibingka is a type of rice cake from the Philippines usually eaten during the Christmas season. It is traditionally cooked in clay pots lined with banana leaves. 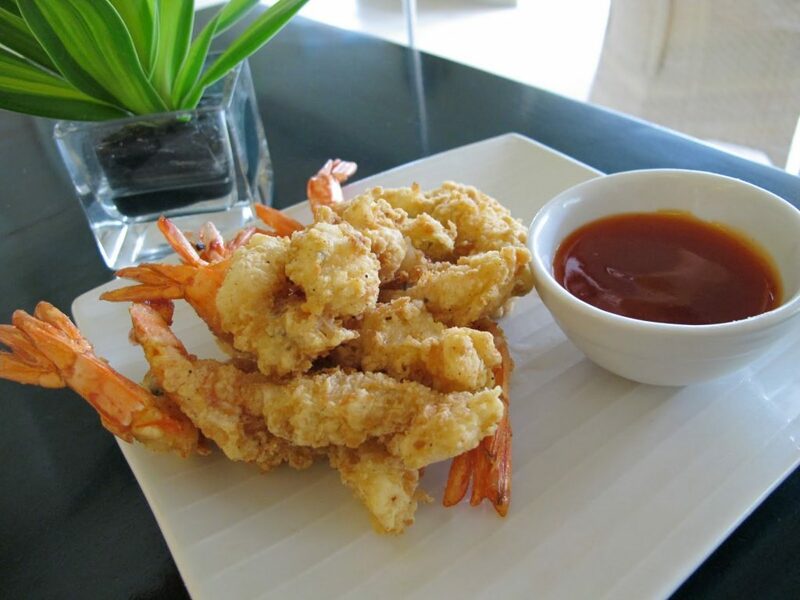 Camaron rebosado (battered shrimp) is a deep-fried battered shrimp dish in Philippine cuisine typically served with sweet and sour sauce. It is similar to Japanese tempura, although tempura uses a lighter batter. It is a staple food in Philippine cuisine. 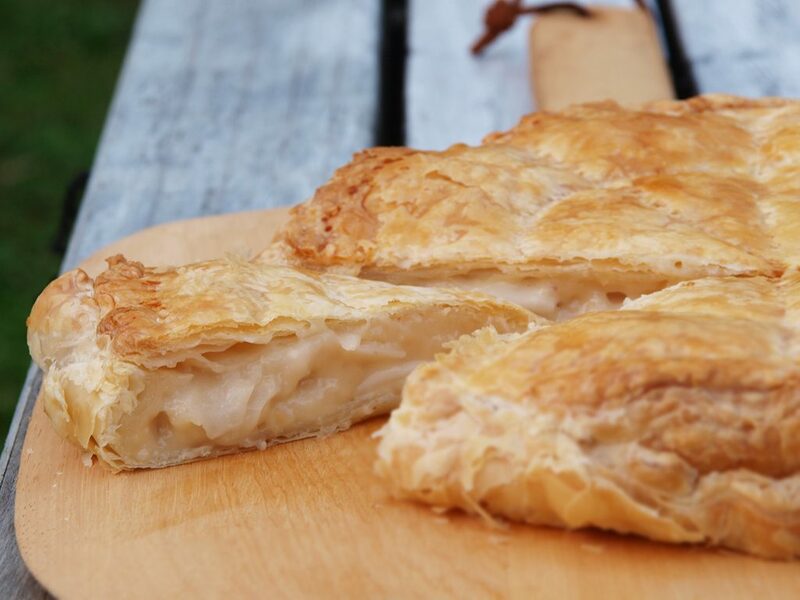 Buko pie is a traditional Filipino baked young-coconut (malauhog) custard pie. It is considered a specialty in the city of Los Baños, Laguna located on the island of Luzon. Read more about Filipino cuisine.